I don't think I'll ever remember how to spell Wednesday. I have to look it up every time! The kids bathroom is upstairs. It is next to impossible to get the boys upstairs and their hair combed in time to get out door every morning. 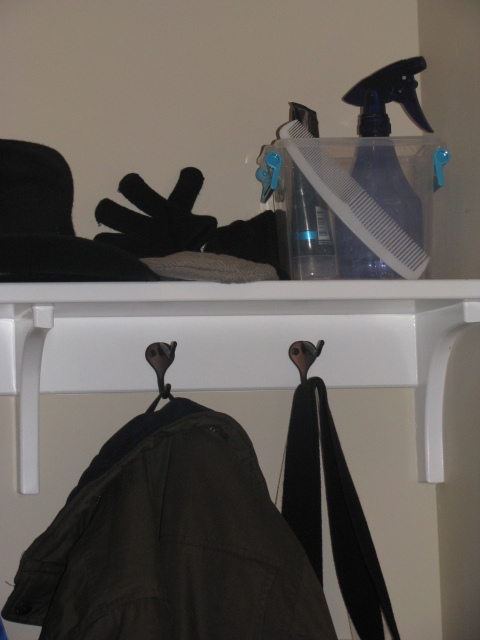 So, I keep a small rubber tote a spray bottle filled with water, comb, and hair gel in the mud room. As they are putting on their shoes I am spritzing heads, slicking down bed head, and combing in a frenzy. 3 boys, 3 minutes, hair done! It seems that no matter how much water and gel, Diego's morning hair will not lay down. No matter how much.